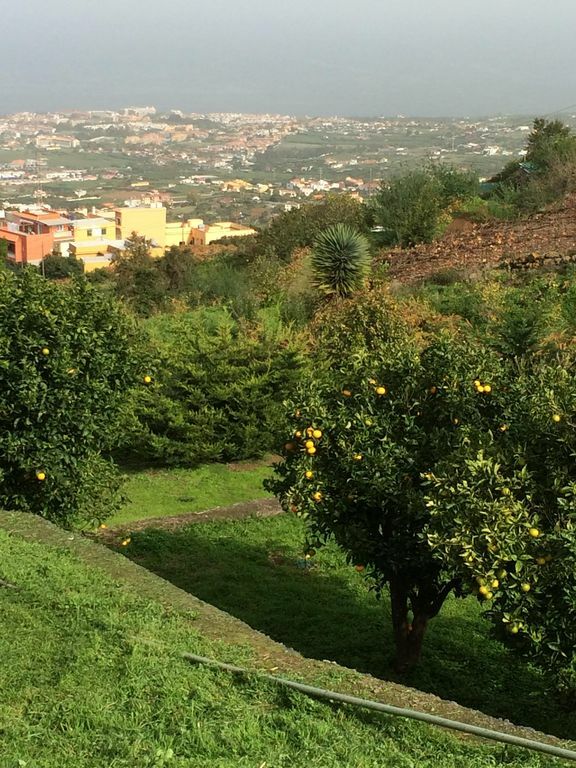 Ces belles maisons de vacances sont situées sur une finca typique des Canaries, située dans la vallée verdoyante de La Orotava. Ils sont parfaits pour ceux qui recherchent le calme et la détente. Ils ont été rénovés à un niveau élevé avec tous les équipements modernes tout en gardant le charme et le caractère qu'il mérite. Ils sont idéalement placés pour accéder aux paysages spectaculaires et aux zones piétonnes dans lesquelles le nord de Tenerife est célèbre. Le village de La Perdoma a beaucoup à offrir aux clients qui souhaitent goûter à la vie typique des Canaries. Les cottages sont entièrement équipés et disposent tous d'une chambre séparée, d'une salle de bains privative et d'une cuisine entièrement équipée, d'un salon confortable avec satellite T. Et WIFI GRATUIT dans toute la propriété. Le vaste jardin pelouse mène à un bain à remous qui peut être réservé à un coût supplémentaire. Vous pouvez choisir vos propres oranges de nos arbres et profiter de la vue incroyable. Propriétaires charmants et discrets. Nous avons passés un très bon séjour. Attention les frileux on est un peu en hauteur donc frais l’hiver le matin et le soir. Le chauffage est d’appoint et pas central. Sinon tout été parfait. Thank you very much for your kind and positive comments , the reviews are very helpful to our business , they help us to appreciate what we have achieved and also to improve on anything that is necessary . The North of Tenerife is a very beautiful place , very different to the south and I know you were surprised at how picturesque the north was as you explored the area . The Cottage is in an ideal location to access all the popular walking areas including the Teide National Park . We enjoyed your company and our chats and want you to know you will both be very welcome back here anytime . Très belle location, bien située pour découvrir l île, magnifique vue, très tranquille, plus calme que le bord de mer. Points négatifs : la route d accès très étroite et très pentue et le fait que la météo n étant pas très bonne lors de notre séjour, il n y avait pas de chauffage dans tout le logement, rien dans la salle de bain, seul un chauffage d appoint dans le salon, insuffisant par rapport à la température extérieure. Me and my partner enjoyed a 10 day stay in this beautiful cottage in La Perdoma. It was our first time staying in the North of Tenerife and we could easily say we preferred it to the South. The property is situated in an ideal place for walking and also for peace and tranquility. Catherine (the host), gave us great advice on places to visit and enjoy, including local 'Guachinches' which are typical Canarian Restaurants, where we sampled the local cuisine and wine. One of the reasons we booked at Los Suertes Finca was the good reviews and feedback that we saw on the internet from past guests. We would certainly return, as there was so much more we didn't manage to see! A big thanks to Catherine and Kevin, for your hospitality. Lage eigentlich sehr schön mit Blick auf das Meer. Nur regnet es in die Wohnung rein! Leider regnet es in die Wohnung rein und zwar in jedes Zimmer, also Wohnzimmer, Küche, Schlafzimmer. Die Vermieter tun so als wäre es das erste Mal so gewesen. Ich finde, so etwas geht nicht und man sollte dafür auch die Miete kürzen. Aber bezahlt haben wir schon längst und ich glaube nicht, dass sich da noch was machen lässt. On Sunday 25th February Storm Emma hit Tenerife , there was a huge amount of torrential rain fell in a short space of time and high winds , this caused widespread flooding and damage throughout the island , both airports were closed causing many holiday makers to sleep in the airports overnight ..the guest called us at 22.00hrs that evening and we visited immediately , there was a small trickle of rain water down the living room wall and a small drip of water in the dining room , we cleaned all up , put down towels and gave reassurance but the gentleman was very angry , we apologised and offered to move them to the cottage next door which was unaffected but they declined . We are obviously disappointed with this review as any owners will know this can be damaging , but I would ask our future guests to look at past reviews of all our 3 properties to get a genuine picture of our standards , efficiency , good communication , cleanliness etc. The only reason I can think for this reaction is that both guests arrived at the cottage not well with influenza virus , I supplied them with correct medication and cut oranges and lemons from my trees to alleviate their symptoms , at one point when one of them was worried about their symptoms I gave them reassurance and offered to drive them to a Doctors if they wished but they declined at that time . From this cozy location, you got a beautiful sea/ mountain view!! We had a lovely stay at this beautiful Atlantic pearl. A nice big terrace, where you can enjoy the fresh mountain air, in a calm location. Thank you for your very kind and helpful comments...We are really glad that you enjoyed Los Suertes and that you shared your thoughts with others. You would be very welcome here any time.